Industrialization fundamentally altered the production of goods around the world. It not only changed how goods were produced and consumed, as well as what was considered a “good,” but it also had far-reaching effects on the global economy, social relations, and culture. Although it is common to speak of an “Industrial Revolution,” the process of industrialization was a gradual one that unfolded over the course of the eighteenth and nineteenth centuries, eventually becoming global. I. Industrialization fundamentally changed how goods were produced. B. The development of machines, including steam engines and the internal combustion engine, made it possible to exploit vast new resources of energy stored in fossil fuels, specifically coal and oil. The “fossil fuels” revolution greatly increased the energy available to human societies. C. The development of the factory system concentrated labor in a single location and led to an increasing degree of specialization of labor. D. As the new methods of industrial production became more common in parts of northwestern Europe, they spread to other parts of Europe and the United States, Russia, and Japan. E. The “second industrial revolution” led to new methods in the production of steel, chemicals, electricity and precision machinery during the second half of the nineteenth century. II. New patterns of global trade and production developed and further integrated the global economy as industrialists sought raw materials and new markets for the increasing amount and array of goods produced in their factories. III. To facilitate investments at all levels of industrial production, financiers developed and expanded various financial institutions. A. The ideological inspiration for economic changes lies in the development of capitalism and classical liberalism associated with Adam Smith and John Stuart Mill. IV. There were major developments in transportation and communication including railroads, steamships, telegraphs, and canals. V. The development and spread of global capitalism led to a variety of responses. C. In a small number of states, governments promoted their own state-sponsored visions of industrialization. (Examples of state-sponsored visions of industrialization: the economic reforms of Meiji Japan, the development of factories and railroads in Tsarist Russia, Muhammad Ali’s development of a cotton textile industry in Egypt). D. In response to criticisms of industrial global capitalism, some governments mitigated the negative effects of industrial capitalism by promoting various types of reforms. (Examples of reforms: state pensions and public health in Germany, expansion of suffrage in Britain, public education in many states). VI. The ways in which people organized themselves into societies also underwent significant transformations in industrialized states due to the fundamental restructuring of the global economy. A. New social classes, including the middle class and the industrial working class, developed. B. Family dynamics, gender roles, and demographics changed in response to industrialization. C. Rapid urbanization that accompanied global capitalism often led to unsanitary conditions. As states industrialized during this period, they also expanded their existing overseas colonies and established new types of colonies and transoceanic empires. Regional warfare and diplomacy both resulted in and were affected by this process of modern empire building. The process was led mostly by Europe, although not all states were affected equally, which led to an increase of European influence around the world. The United States and Japan also participated in this process. The growth of new empires challenged the power of existing land-based empires of Eurasia. 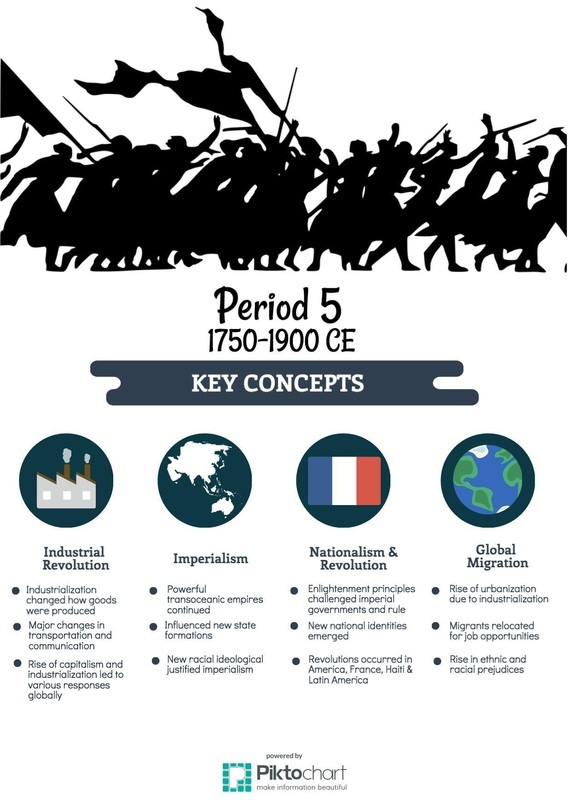 New ideas about nationalism, race, gender, class, and culture also developed that facilitated the spread of transoceanic empires, as well as justified anti-imperial resistance and the formation of new national identities. I. Industrializing powers established transoceanic empires. E. In other parts of the world, industrialized states practiced economic imperialism. (Examples of industrialized states practicing economic imperialism: the British and French expanding their influence in China through the Opium Wars, the British and the United States investing heavily in Latin America). II. Imperialism influenced state formation and contraction around the world. A. The expansion of U.S. and European influence over Tokugawa Japan led to the emergence of Meiji Japan. B. The United States and Russia emulated European transoceanic imperialism by expanding their land borders and conquering neighboring territories. III. New racial ideologies, especially Social Darwinism, facilitated and justified imperialism. The eighteenth century marked the beginning of an intense period of revolution and rebellion against existing governments, and the establishment of new nation-states around the world. Enlightenment thought and the resistance of colonized peoples to imperial centers shaped this revolutionary activity. These rebellions sometimes resulted in the formation of new states and stimulated the development of new ideologies. These new ideas in turn further stimulated the revolutionary and anti-imperial tendencies of this period. I. The rise and diffusion of Enlightenment thought that questioned established traditions in all areas of life often preceded the revolutions and rebellions against existing governments. A. Enlightenment philosophers applied new ways of understanding the natural world to human relationships, encouraging observation and inference in all spheres of life; they also critiqued the role that religion played in public life, insisting on the importance of reason as opposed to revelation. Other Enlightenment philosophers developed new political ideas about the individual, natural rights, and the social contract. B. The ideas of Enlightenment philosophers, as reflected in revolutionary documents—including the American Declaration of Independence, the French Declaration of the Rights of Man and Citizen, and Bolivar’s Jamaica Letter—influenced resistance to existing political authority. C. Enlightenment ideas influenced many people to challenge existing notions of social relations, which contributed to the expansion of rights as seen in expanded suffrage, the abolition of slavery, and the end of serfdom. III. Increasing discontent with imperial rule propelled reformist and revolutionary movements. B. American colonial subjects led a series of rebellions—including the American Revolution, the Haitian Revolution, and the Latin American independence movements – that facilitated the emergence of independent states in the U.S., Haiti, and mainland Latin America. French subjects rebelled against their monarchy. IV. The global spread of European political and social thought and the increasing number of rebellions stimulated new transnational ideologies and solidarities. A. Discontent with monarchist and imperial rule encouraged the development of political ideologies, including liberalism, socialism, and communism. Migration patterns changed dramatically throughout this period, and the numbers of migrants increased significantly. These changes were closely connected to the development of transoceanic empires and a global capitalist economy. In some cases, people benefited economically from migration, while other people were seen simply as commodities to be transported. Migration produced dramatically different societies for both sending and receiving societies, and presented challenges to governments in fostering national identities and regulating the flow of people. I. Migration in many cases was influenced by changes in demography in both industrialized and unindustrialized societies that presented challenges to existing patterns of living. A. Changes in food production and improved medical conditions contributed to a significant global rise in population in both urban and rural areas. II. Migrants relocated for a variety of reasons. B. The new global capitalist economy continued to rely on coerced and semi-coerced labor migration, including slavery, Chinese and Indian indentured servitude, and convict labor. III. The large-scale nature of migration, especially in the 19th century, produced a variety of consequences and reactions to the increasingly diverse societies on the part of migrants and the existing populations. A. Due to the physical nature of the labor in demand, migrants tended to be male, leaving women to take on new roles in the home society that had been formerly occupied by men.